How do I enter BIOS or Boot Selection on the Vault? In order to enter the BIOS Setup mode at boot, hold down the DEL or ESC key when powering up. In order to enter the Boot Selection screen at boot, hold down the F11 key when powering up. In either case, when the expected screen appears, release the key. How much power does the Vault use? The power supplies and power consumption ratings can be found in the Product Comparison table at this link. The Vault’s memory is Dual Channel. For the performance minded, this means that you will get better memory bandwidth by using 2x DIMM’s instead of 1. Please note this is only relevant to the 6 port Vault, as it is the only product that supports 2x DIMM’s. What is the proper way to shutdown the Vault? The proper way to shutdown the Vault is to briefly push the power button or choose a “shutdown” option from within the operating system that is running on the Vault. The system will then shutdown in an orderly manner (as long as the Operating System allows and is configured for this functionality). Simply pulling the power cord or removing power could result in a corrupt file system and/or erratic behavior at the next reboot. Specific to pfSense CE, a brief push and release of the power button will shut the system down. Is Protectli hardware affected by the Intel C2000 hardware issue? A hardware defect was recently disclosed by Intel that affects their C2000 series chipsets, causing them to suddenly stop working (more detail can be found here or with a simple google search). The good news is that no Protectli products use the CPU’s that are affected by this defect, so Protectli hardware is safe. Protectli does have an Atom based product available, but again, this product is not based on the Intel C2000, so there is nothing to be concerned about. For any further detail, or questions, please feel free to reach out to support. Can I use the Vault in another country? Every Vault model comes with a switching power supply capable of accepting 100-240V AC at 50-60Hz. Thus, the Vault’s power supply can be used just about anywhere. The only note would be that the user needs to be sure to obtain a power cord that can be used with the Vault’s power supply in your country. 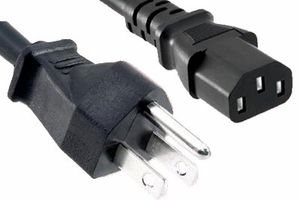 The power supply cord supplied is a NEMA 5-15P. An example can be seen below. Can I install Windows on the Vault? Yes! Windows will run on the Vault! We’ve tested the 4 port version, as well as the 6 port version of the Vault and validated that Windows is a relatively strait forward installation. More detail can be found in our Knowledgebase Article. What software is the Vault compatible with? The Vault has been tested with a number of different operating Systems. Many customer use the Vault with pfSense, while others use it as a small server running Windows. Please see our Knowledgebase (linked here) for a details on a variety of different operating systems. Yes, you can. The Vault’s COM port is a hardware redirect from the video port, so you can access the BIOS. Some customers never even use the video ports, only the COM ports! Generally speaking, Protectli products are warranted to be free from manufacturing defects for a period of 180 days from the purchase date. More specific details can be found on our Product Warranty Page. What is the “COM” Port for? Some Vault models have an external COM port that can be used as a serial console connection to view the Vault’s output. This output is simply a redirection of the Vault’s VGA or HDMI port (depending on the model you have). This can be useful in the event that you need to access the Vault’s output, but don’t have a monitor handy, or for more permanent remote adminitration uses. The COM port defaults to 115200, which can be changed in the Vault’s BIOS. The new 6 Port Vault’s from Protectli allow the installation of a 2.5″ drive, inside of the unit. The Vault will fit drives up to 9mm thick. For heat reasons, we recommend that users only use SSD’s when mounting a drive inside the Vault. Further, the 6 Port Vault comes with a SATA cable, as well as a SATA power cable that can be used to connect internally mounted 2.5″ SSD’s. Please note that the 4 Port Vault CANNOT accommodate an internally mounted drive, other than the mSATA. While all Vaults (2 port, 4 port, and 6 port) include an internal SATA header along with drive power header, the 6 port is the only unit that has enough room to accommodate a drive mounted internally.